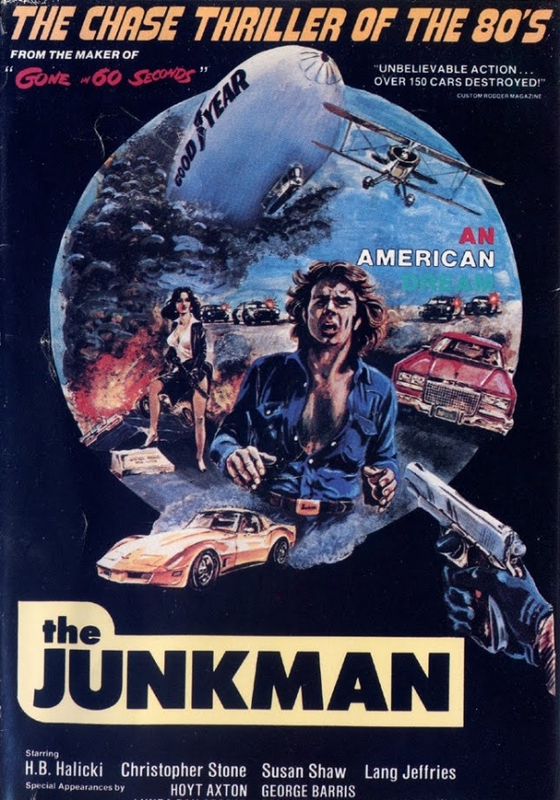 So, The Junkman is the follow-up to the original Gone in 60 Seconds, both of which were produced by, written, directed and starring this guy H.B. Halicki. He's an interesting guy who died pretty tragically during a stunt scene he was shooting for his sequel to Gone in 60 Seconds. Conceptually, this is an interesting movie-- it's quasi-autobiographical, in that it's about the director of Gone in 60 Seconds, who for some reason is being hunted down by a group of assassins who have been hired by an unknown party for unknown reasons. There's a scene in the movie where his character in the movie is directing a stunt scene that would later appear in the movie he made after The Junkman. Hoyt Axton is in it, and aside from his obligatory singing scene, we learn that he is apparently a good guy to know if you need clothes, a gun, and a car on short notice. How could any of this possibly go wrong, you wonder? Weeellllll... let's just say that the end credits sequence was our favorite part of the movie, and not just because it's weird and kind of unsettling-- seriously, check out the video below. Also, as some housekeeping-- for the next few months we're going to be releasing episodes every other week rather than on a weekly basis, mostly because Andrew is a big baby and is all like, "boo hoo hoo, i'm in grad school and I don't want to mess up working on my big final project". Can you believe that guy? NEXT TIME: Samurais! Wait, is the plural of samurais just samurai? If only there were some resource readily available at our fingertips that we could reference. Alas!